The brains of the softener! Our patented programming monitors your water use and determines when a regeneration of the softener is needed. You use up to 60% less salt! The system learns your water use patterns and actually gets more efficient as it learns. “Look Ahead” also calculates the precise amount of salt and water to use to regenerate only the portion of the resin beads that have been used (depleted). This saves you salt and water and is why North Star softeners lead the industry in rated efficiencies. In the event of a loss of power, North Star water softeners maintain accurate time for up to 72 hours – without batteries. For longer power outages, only the current time needs to be re-entered, the system remembers the rest. North Star water softeners are securely sealed to protect circuitry from salt corrosion and high humidity so your water softener lasts longer. North Star pioneered this method where brine water is drawn into the bottom of our resin tanks which enhances the regeneration process. This is the preferred method but practiced by only select manufactures. Patented “Look Ahead” Technology monitors your water use and determines when a regeneration of the softener is needed.You use up to 60% less salt! The system learns your water use patterns and actually gets more efficient as it learns. “Look Ahead” also calculates the precise amount of salt and water to use to regenerate only the portion of the resin beads that have been used (depleted). This saves you salt and water and is why North Star softeners lead the industry in rated efficiencies. 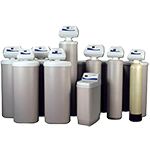 Super Cap® Time Keeper – In the event of a loss of power, North Star water softeners maintain accurate time for up to 72 hours – without batteries. For longer power outages, only the current time needs to be re-entered, the system remembers the rest. No-Worry Setting – No vacation setting is required. If you’re not using water, it does not regenerate. That saves salt and water. Heavy-Duty Valve has fewer moving parts than other valves – so there’s less to go wrong!